While laptops and tablets are the better-known stocking stuffers this time of year, there is a lot value on the market for desktop PCs geared for business use during the holiday season. We are seeing prices dip well below $550 for standard-specification machines suited for basic production work. As we examined earlier this year, when it comes to computing power per dollar value, it is hard to beat the desktop machine. See related: Desktop Computers, Once Declared Dead, Rise From the Tomb. While a $550 price point might not seem like a great deal on the consumer market, it is really the maintenance and management costs that become the major business expenses over the course of a computer’s lifetime. Business machines are built for easy maintenance, offer manufacturer support, and ready for hardware expansion. Each of these machines has similar specs under the hood—4 GB random access memory (RAM), a multi-core processor faster than 3 GHz, a licensed copy of Windows 7 Professional, and may have a dedicated video card. Additionally, each has a small-form build, three-year warranty, and features that optimize them for central management, easy wiping and re-imaging, and hardware-level security. HP released this line of desktops at this time last year, targeting SMBs with their marketing efforts. It is a compact machine built for expansion if needed. It runs on Intel® hardware. The ProDesk comes with a 3-year manufacturer warranty, and 24/7 phone support during that time period. The computer is tested for 115,000 hours of use. The HP Support Assistance software provides a useful tool for wiping and re-imaging computers, and has auto-update features as well. This model is marketed towards mid to large enterprises with a host of energy-saving certifications and designed to save money on large-scale deployments. The ThinkCentre line has feautures useful for SMBs as well, particularly a low price point, something that the number one PC supplier in the world can tout in this market. This model has been around since 2012, but performance specs are on par with other models in its class. It runs on AMD hardware. 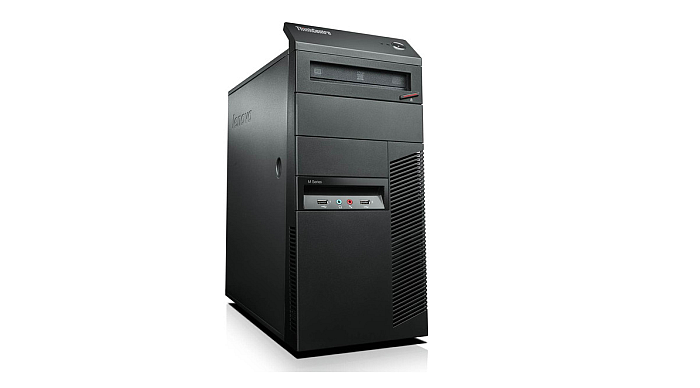 ThinkCentre comes with a 3-year manufacturer warranty. Trusted Platform Module (TPM) features encrypt data, digital certificates, and passwords, providing applications and electronic transactions an added layer of security. Remote management is handled by Desktop Architecture for System Hardware (DASH) 1.1 standard. The main selling point for this line has always been its room for expansion—namely for RAM. It supports tri-monitor displays and has four USB ports. What does paying a little extra ($700-$800) get you? Generally, you start seeing 1 TB of hard disk space, and faster processors—namely Intel Core i5 and i7—which are built for multi-tasking. They come equipped with 64-bit Windows 7 and Windows 8, which is designed especially for running in systems with larger amounts of RAM. Another performance-enhancing feature found in machines in this price range is L3 cache architecture, which lets multi-core processors share a common pool of memory, which allows for faster processing speeds especially when multiple programs are running simultaneously. When shopping for tech around the holidays, it is always a good idea to check out ways to upgrade at the office as well. NeweggBusiness regularly runs promotions on desktop PCs and business computers, especially around this time.